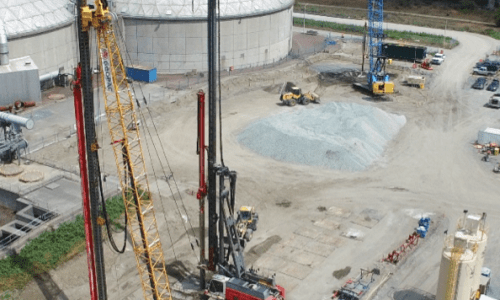 Metro Vancouver is upgrading the Annacis Island Wastewater Treatment Plant located in Delta, BC as part of the Stage 5 Phase 1 expansion, with the intention to meet the increased flow demand in wastewater treatment needs. The site’s soil conditions generally consist of 5m of sand fill, overlying 2 to 4m of clayey to sandy silt, underlain by loose to compact alluvial sand extending to depths of approx. 35 to 45m. The groundwater level was measured at depths of approx. 5m below existing grade at the time of investigation. 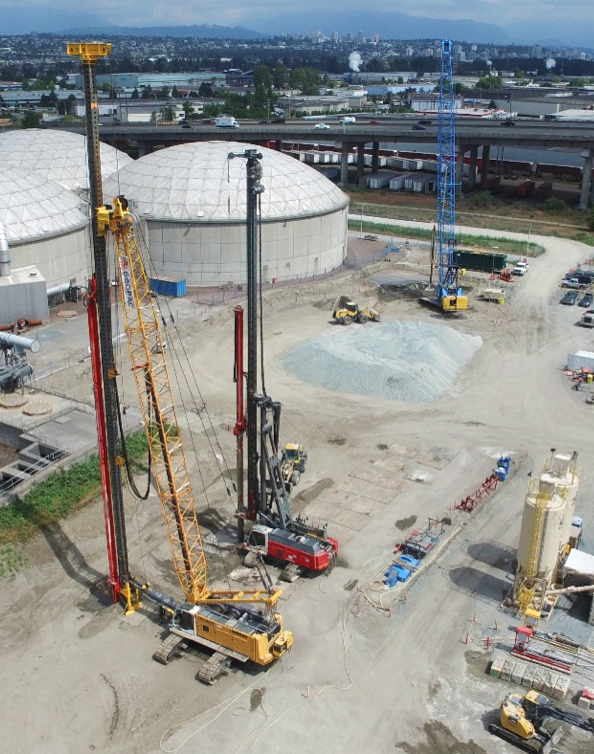 Geopac, with support from their JV partner JJM Construction, has completed their largest ground improvement contract to date at the Annacis Island Wastewater Treatment Plant in Delta, BC. The scope of work consisted of densifying 47,000 m2 using Vibro Densification methods to treatment depths of 32m to 34m. Geopac was required to achieve stringent CPT performance criteria based on post-disaster design requirements and liquefaction mitigation for a 1:2475 year seismic event. Working within an operating WWTP facility, Geopac also conducted real-time survey monitoring on surrounding critical WWTP utilities and structures during the Vibro Densification. The survey monitoring program observed settlement / displacement patterns that would impose a risk to the integrity of the WWTP facilities if Vibro Densification continued to encroach. In response, Geopac proposed using Cutter Soil Mixing to construct an in-situ wall separating the Vibro treatment areas and surrounding facilities to limit settlements and allow Vibro Densification to proceed up to the design treatment limits. A trial area confirmed the proposed CSM wall solution would reduce displacements within tolerable limits and was installed at critical areas along the treatment limit boundaries.